4 bedrooms, 4 bathrooms, living/dining room, family room, Jekyll room, newly remodeled kitchen, double garage. Unlimited Domestic Long Distance. POOL PRIVILEGES @ DAYS INN. 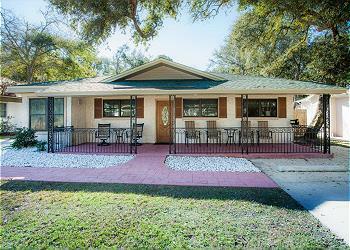 MW, DW, W/D, 4 Satellite Wide screen TVs, DVD, WiFi/DSL, GAS GRILL, NO PETS, NO SMOKING Accommodates 11. One of the largest kitchens we have ever experienced in our lives and the center point of this house. The house is long as in bowling alley and coverd in floor tile, so easy keep clean. Great location and a garage. You could do at lot worse than this property.We stayed for 4 months and enjoyed it. We stayed here of 4 months from Dec/18 to Apr/19 and loved the large kitchen and the garage. We also loved the location , which is good for walks on the beach, bikng or golf. Place has been recently renovated and is in very good condition. Would enjoy renting it again, if it is available. We love this cottage. It’s always clean and beautiful. It’s in a perfect location to the beach. You can hear the waves from the porch. The staff at JR are great to speak with and very informative about the cottage. We’ve thankfully never had to call about anything during our stay at this cottage. But I’m sure if we had to, they’d have whatever the issue was taken care of in a timely manner. Thanks for another great relaxing vacation on Jekyll. This is our 17th year coming to Jekyll, see you for 18!! This house is perfect for our family. Lots of space, plenty of bathrooms, great kitchen, close to the beach, nice front patio. Had a great time. House well stocked in kitchen and with hand soaps and dish detergent and garbage bags. Owner left beach chairs and floats available in garage which should have been listed in home info so I did not have to take my beach stuff. Outside shower, clothes line and gas grill were well used. Home had games and lots of well labeled VCR tapes. short walk to boardwalk to beach.